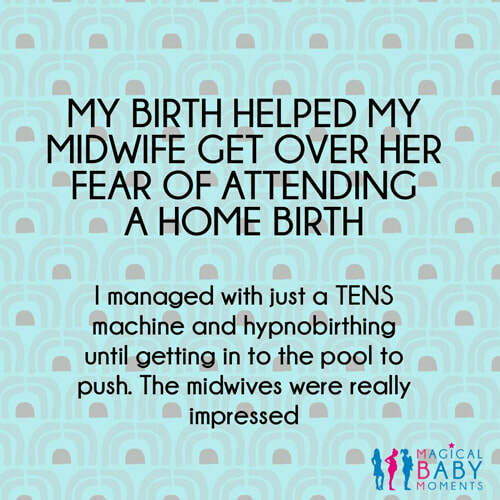 "My baby was back-to-back so it was a difficult delivery, but the best part was in the pool with our hypnobirthing scripts playing and gas and air. I did have to get out the pool to deliver him." ​My waters broke at 37 weeks plus one. I was excited and a bit nervous too. David was there and my sister as well (both my birth partners). I thought to myself "in less than 24hrs, we will get to know our baby.” Mentally I was calm. Olivia's bag was ready. We were ready. We went to the Birth Centre and when they checked my tummy they made comments about the position of the baby's head: not fully engaged and perhaps oblique. They recommended we go to the local hospital for a scan. They confirmed head was down, but not fully engaged. They disagreed with the idea of the baby’s head being oblique, although it is possible that it moved. After hearing their assessment, they sent us home to wait for labour to start by itself. Once at home, I was positive that we could do it naturally. I was hoping for labour to start so I did my best to keep active and calm. We went for a walk, we watched a movie; I used the birthing ball and lit a candle too. I only felt some sporadic contractions throughout the night and didn’t have much sleep because my mind was thinking a lot, anticipating the big day and being curious about how things were going to take place. The plan was ready, and I was ‘prepared’. Next morning, we went back to hospital at 8am. They checked again and suggested to start with an induction. We discussed the possibility of waiting more, but I was reminded of the risk. At midday they introduced a gel. Six hours later they suggested another gel for another six hours because dilation was at 1cm. The contractions were happening, but they were sporadic. At the end of the second gel the dilation showed little progress. While this induction was happening, I kept positive and calm. I managed to walk around the hospital, take a shower, use the birthing ball, and practise different positions for dealing with contractions. At midnight, they started with the hormone drip, controlling the amount by keeping an eye on the effects of it. As they increased it, the contractions became stronger. I dealt with contractions by breathing in and out. I was able to remember all those images and techniques I was taught during my yoga and hypnobirthing lessons. At the next assessment I was 3cm. To be honest I felt a bit disappointed with my body and the outcome. I wanted to hear that I was 6 or 7cms. Unfortunately, that wasn’t the case and events were taking a different course. They increased hormone dosage. Olivia was not 'happy'. The contractions were getting stronger. One of the midwives reminded me about pain relief options. Although I was reluctant to use any of them, at this point it felt alright to go for it. As things were happening, I was calm in my mind, but at this stage I was more aware that plans were gone and new ways had to be considered. They increased hormone drip up to 40ml. Olivia's heartbeat kept dropping. There was pressure on time due to the waters breaking more than 48 hours earlier. My birth plan, my ideal image of giving birth naturally, my wish to feel my baby coming out, was slowly fading away. They did another vaginal examination and found I was 3cm but the baby’s head was upwards (posterior position). It was recommended that we opt for an epidural. Those positive affirmations that help to focus on the arrival of the baby are very helpful when facing difficulties. The epidural was sorted not long after we made the decision at around 9:30am. At 10:30am, the heartbeat of the baby dropped again, and the emergency buzzer was activated, calling more staff in the room. They introduced a device (clip) to connect to the head of the baby and facilitate a more accurate monitoring. At 2:10pm the baby wasn't happy again. A doctor reviewed the situation; I was 4cm. Due to not progressing enough and baby’s health being compromised, a c-section was suggested. It was clearly not what I planned and personally I would have never chosen this option myself. However, it felt there was no way out. I was exhausted physically and energetically. We agreed. At 4:25pm our baby Olivia was born. She was assessed, and everything was fine. This chapter had ended but a new one was clearly starting…parenthood. I wanted to drop a quick line to let you know that baby Renee was born weighing in at 8lbs 3 ounces. It was a natural delivery - I was induced (38 weeks) as I was found to have gestational diabetes. I was induced twice over 12 hrs to begin with. I was having mild contractions, but nothing was happening. The baby's heart rate was being monitored and she was fine. Things seemed to slow down after that. I dilated only a further 2cms (to 8) in the following 8 hours after that which made the consultants advise that they were going to give me a Caesarean. I was heartbroken (and frankly a bit pissed off!) when I heard this as I have always been dead set AGAINST having a Caesarean. The process from 1st induction had taken about 27 hours up until this point and it felt like such a waste to have gone through all of that to get cut open anyway. I also was conscious of the fact that help at home is limited for me, so I also wanted to avoid the recovery time needed for a Caesarean (in conjunction with looking after the baby). The consultant told us they were preparing the theatre for my Caesarean and left the room. When she left - my midwife (who could see that I was devastated) gave me some jelly babies. She got Jeff and my sister-in-law to prop me up on my feet. In the 30 mins that ensued she used every trick in the book to try and get the baby to drop the final 2cms required for a natural delivery. Birthing her was a bit intense but this time round I was mentally prepared for it. I had a forceps delivery and 5 stitches (they cut me as opposed to a tear) but two weeks later it's all healed up nicely and she is perfect. It was a much better outcome than being confined to a chair if I had had the Caesarean. I wanted to say (on behalf of both Jeff and I), thank you for your time - I'm currently signing up to as many mother and baby classes as possible in the hope I'll make some new friends! Hopefully we'll bump into you soon! “After trying absolutely everything to induce labour naturally, we agreed to go in for medical induction at 41 weeks and started off with the gel, which kicked off contractions nicely. It was a slow process, but the contractions were fairly strong, so I focused on up breathing and visualisations to get through it. They told me that once I had dilated enough, they would break my waters to help push things along further. The vaginal examinations were uncomfortable enough, so I wasn’t looking forward to that procedure, so my husband read a relaxing script which really helped, along with a bit of ‘gas and air’. Labour continued to progress slowly, so they also gave me the drip. As the contractions got stronger, the hypnobirthing techniques really helped me to deal with them. Every midwife and doctor I saw couldn't get over how I was surviving all this time just with the tens machine and ‘gas and air’, as they see most women begging for epidural in inductions – instead I was calm and smiling between contractions! In the end, after 52 hours, my labour stalled, and they found baby’s head had moved slightly to the left and was swelling, so we had to have C-section before it got any worse. For me, that was my worst outcome for birth and one that I really wanted to avoid. I used the scripts and breathing to stay as calm as possible throughout it. All worth it of course, as we now have a beautiful, calm, happy baby. “As a first-time mum, I had studied all the possible options of where to deliver my son and decided that a home birth with a pool was what we really wanted. Labour started around midnight and we called the hospital. Knowing that we were just at the very beginning of this journey, we knew the midwife wouldn’t come for a little while. My husband and I set up ‘camp’ in the living room and tried to get some sleep - easier said than done with the excitement that our boy was on his way… The midwife came and checked us, we were both doing well and after observing us for a while decided to leave us in peace and to call her if we needed her (though her shift was finishing at 8am, so it was likely that the next visit would be with a new community midwife). “After a complicated first birth and an anxious pregnancy, I took the time to really practice hypnobirthing techniques. I admit that very early in hospital I did have a wobbly and wondered whether I had the strength to do this labour naturally, but that doubt quickly got quashed and the hypnobirthing practice took over and helped me through the labour. With a labour progressing through the night, we walked the corridors of what seemed like an eerily quiet hospital – it almost felt exclusively for us. The hours seemed to pass quickly and soon we were moved to the labour ward. After a quick chat with our midwife, she sent us off for another lap around the hospital. On our return, she left us on our own in our room, reassuring us that she was just outside. My husband and I were joking one minute, then we suddenly realised that we hadn't taken any photos, so we took a shot and then within a couple more surges, I felt that something had ‘changed’. The midwife whizzed back into the room and told us we were good to go. Wanting to remain upright, I knelt and leaned my arms over the back of the bed. With a few soft down breaths my daughter was in my arms. We did it! !